Robert Loomis has always wanted to own a machine that would attract attention and tickle his adrenaline gland. He found both in his Tomb RZR. 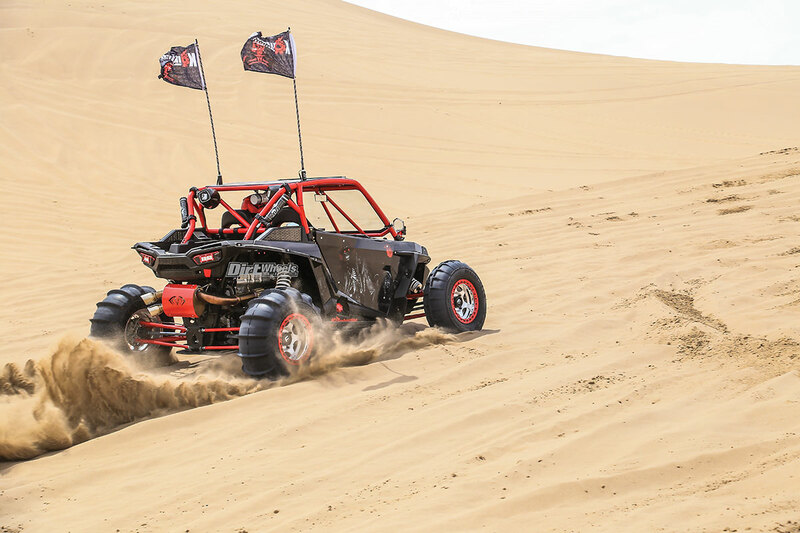 We appreciated the hook-up that the Sand Tires Unlimited paddle tires provided in turns or straight lines. You can see from the price list that neither Loomis nor Kombustion were slaves to any one company. Rather, they picked and chose from available products to make a compelling package. The areas of concern were chassis, engine performance, passenger comfort, safety and style. Billet STM clutches are too pretty to keep covered up. They hook up hard and are reliable with the added power. Chassis mods started with a Fireball Racing long-travel kit. The Fireball parts were coordinated with Rhino heavy-duty axles, Assault heavy-duty sway bar end links and barrel-style +4-inch long-travel HD tie-rods. It also uses an Assault chassis plate to strengthen things. The undersides get help from a Trail Armor skid plate with sliders. 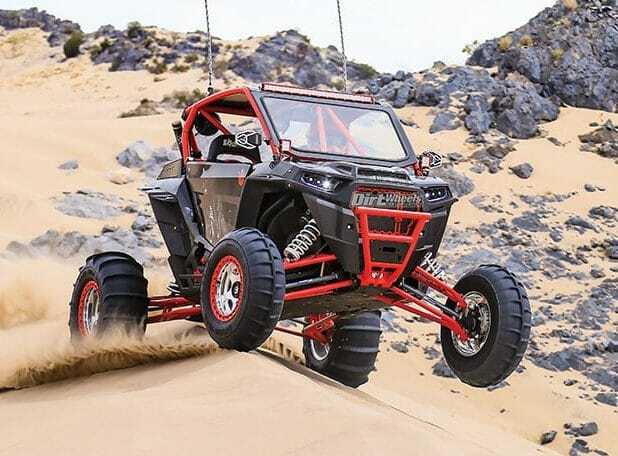 Falling under chassis and safety is an SDR Motorsports XPR-2 Shorty cage with a built-on roof with an integrated front light pocket and windshield. It is matched with SDR RZR Hi-bred doors with door bags. The shocks only required a ZBroz Racing RZR XP Turbo Fox Edition spring kit with spring retainers to handle the long-travel suspension. 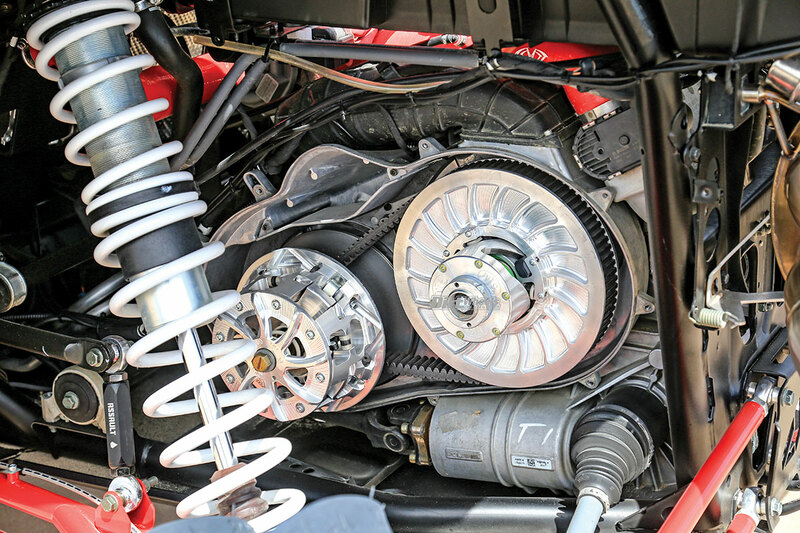 Fuel Off-Road forged Gatling wheels with red bead-lock rings are wrapped with Sand Tires Unlimited 1300/1200 non-comp-cut sand paddles finish up the chassis mods. 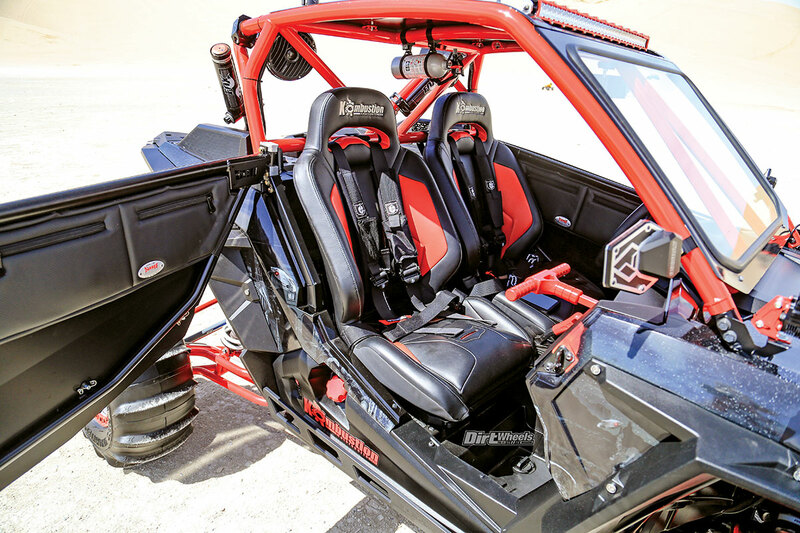 The Tomb RZR interior is a very nice place to spend quality time in. The seats are supportive and comfortable. 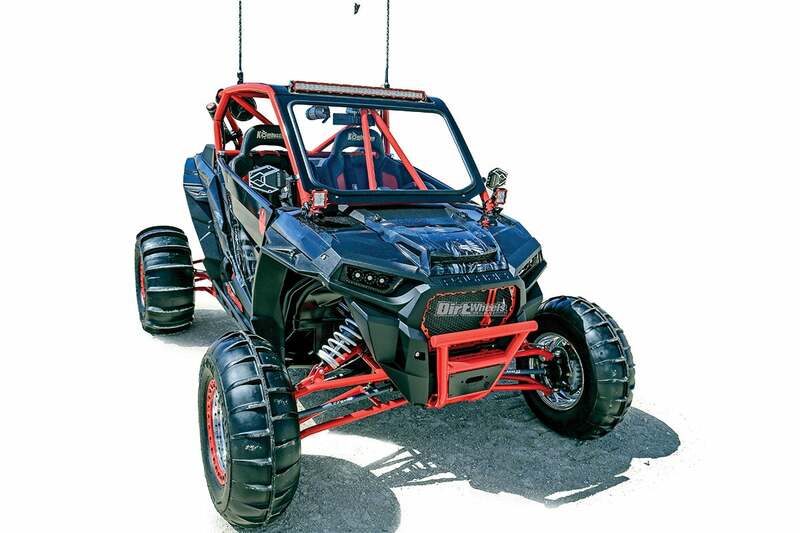 Loomis is a hot-rodder after all, and the 2016 RZR Turbo is not as powerful as later models, so mods were in order. 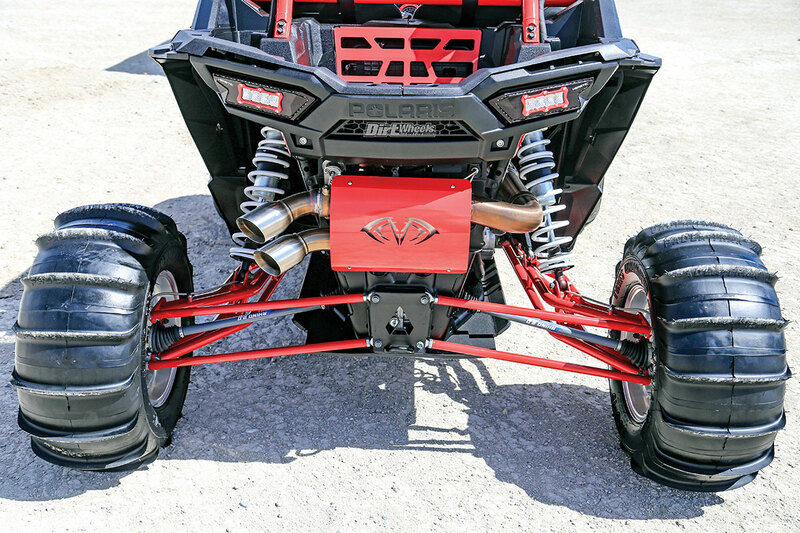 He opted for Evolution Powersports’ RZR XP Turbo Stage 6 Sandblaster big turbo kit with a flashed ECU. The base kit was boosted with a silicone charge tube, turbo V-flow intake boot and a billet-aluminum blow-off valve. He also runs the Captain’s Choice cut-out exhaust. It allows the driver to bypass the muffler for more power. Turbos muffle the exhaust pretty well, so the machine isn’t that loud. He chose a serviceable air filter fitted with a pre-filter. Other related accessories are a Maptuner to adjust the ECU and heavy-duty STM clutches run without a cover in the dunes. They look cool and work great. For reliability, Loomis added an Empire Industries XPT billet fuel rail. The 2016 RZR Turbos had some cooling issues when run hard, but Loomis and Kombustion took care of that with a TCP Performance radiator kit to increase cooling for the engine and to make it more comfortable in the cab. Pretty much the business end right here. Plenty of power, ample suspension, wide stance and mega traction. You can tell that Loomis likes to drive this machine. It is set up nicely to spend time in. Settle into the car and you feel the Assault Ballistic D steering wheel, and you settle easily into Pro-Armor G-Force suspension seats. You then tie yourself down with Pro-Armor four-point, 2-inch, harness-type seat belts with sewn-in comfort pads. Even with the roof, visibility-front is good, and in-cab mirrors from Axia Alloys and outside B2 Bomber mirrors from Assault take care of the rear view. There is a grip-style shift knob from Modquad, and they make the passenger grab handle as well. The speakers take up a little room, but you forget that fact when you crank up the Rockford Fosgate Stage 4 600-watt PMX-2 stereo mated to front speakers, a sub and rear speaker kit. You won’t have trouble hearing this one. This dune jump had an uphill landing that should have been a rough hit, but the Tomb RZR soaked it up. There are other additions that add style, but some, like the powerful lighting, even add safety as well. Baja Designs’ rock lights are an example. They light up under the wheel wells, so they look cool, but they also help with wheel placement in technical driving. The rest of the lighting is from Heretic Studios. They replace the stock headlights, and there is a roof and front shock-mount light bar. There are also 5150 lighted whips. Current Turbos have a wider grill opening, so Kombustion upgraded the front end to 2017 parts with a red billet grill. Then a Kombustion wrap gave Loomis the unique look he was after. The Fireball Racing long-travel kit is light but strong with ample clearance front and rear. 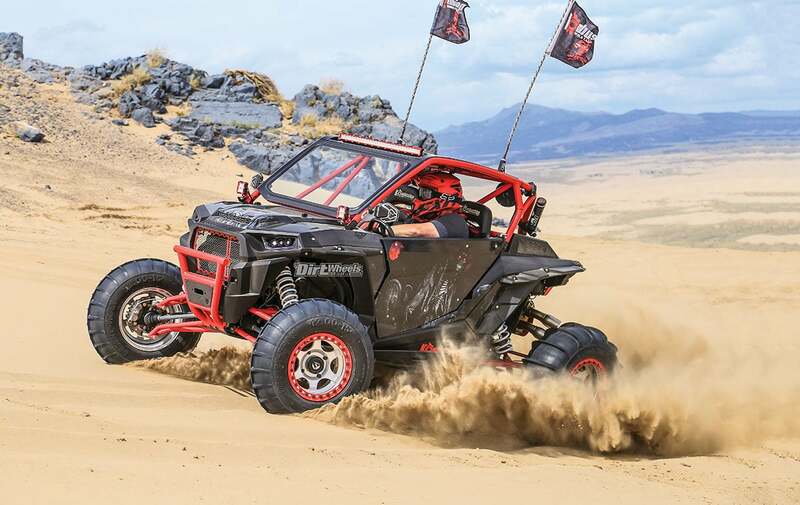 We drove the Tomb RZR at Utah’s Little Sahara dunes. There are some steep climbs and large bowls where plenty of power is very handy. The same is true of the wide stance and long travel. We found this machine to be quite comfortable with good visibility from inside the cab. Stab the throttle and it rips the climbs. The tires bite hard, so acceleration is brisk and doesn’t really taper off. We tried some steep sand trails, and it is plenty nimble (unlike some wide, long-travel cars) and fun to drive. 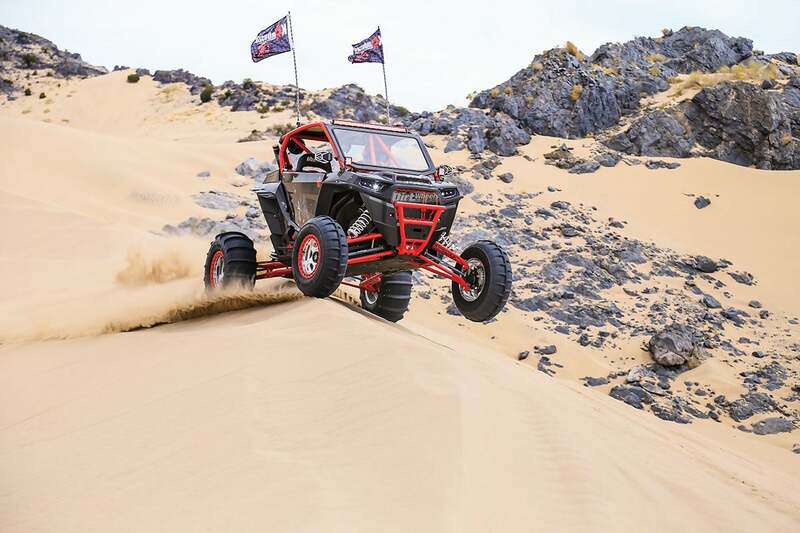 We stepped into this machine from the new RZR Turbo S, and the Tomb RZR pulls stronger and had suspension that was obviously dialed in for the dunes. We don’t normally like black machines, but this one has enough red accents to make it really stand out. It works like it is supposed to, runs hard, is comfortable in the rough and handles well. Lara Croft would approve, and so do we. 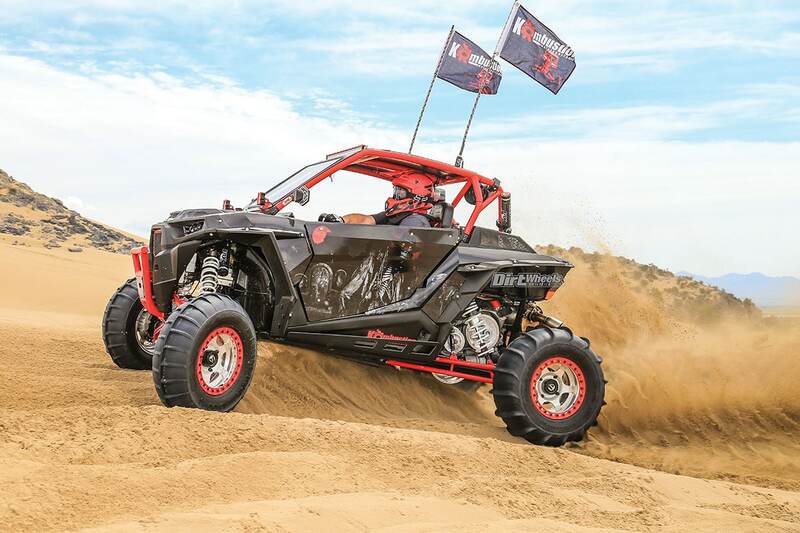 Some wide, long-travel machines with paddle tires are ponderous in the turns, but the Tomb RZR is nimble in the sand.